Shad are the aquatic equal of robins in their ability to herald spring. Every year, a generation of these anadromous fish begins the reproductive phase of their life cycle when, veterans of the Atlantic Ocean, they return to their fresh water origins where they will spawn. Members of the herring family, shad populate the entire east coast; tagging studies have shown the same fish in the ocean off Nova Scotia in summer that wintered off Florida. As soon as the water temperature sends its signal, usually sometime in mid March, millions of fish enter the Delaware Bay to begin the long and arduous upstream swim toward the river's head water in the Catskill Mountains. The restless army enters the river proper in smaller divisions; schools clustered densely at the center of the run with advance brigades in front, followed by platoons hanging back at the rear. Their mission is simply to swim, females following males to nesting locations along a journey that, for some, can continue for more than 300 miles. The migration, a staple for European Colonists and the bounty for great commercial fisheries through the 19th Century, has meant an American harvest. Rivers were once black with fish, but the shad population met typical devastation attributable to overfishing, pollution and river damming. In the Delaware, prior to the turn of the century, most spawned way down river below Gloucester, where the water was once clear enough to allow the mating rituals. Today, spawning doesn't begin to take place until the schools approach the Delaware Water Gap, and, due to the trip's increased stress, modern shad are typically robbed of their golden retirement years, unable to complete the return trip to the ocean. According to Charlie Groth, who works at the Lewis Fishery, "the shad do not usually die after spawning. That’s quite common in rivers down south, but in the Delaware you get repeat spawners. You can tell how many times a shad has spawned by looking at the scale, which works like rings on a tree. In years when that fish has spawned, the scale will have a ridge on it. " The abundance of shad in spring reminds us again how fortunate we are to have in our midst the largest free flowing river in the East, one that has eagerly responded to conservation and clean up efforts. Nowhere is this thanks better expressed than at the annual Shad Festival at Lambertville, where the tiny city's commercial links with shad span more than a century. 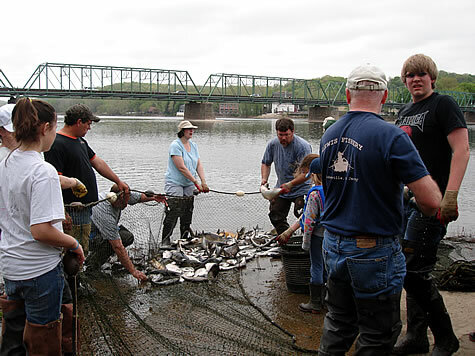 The Lewis family of Lambertville, whose island fishery dates to 1888, and who hold the only remaining commercial license to catch shad with nets, have been key participants since the festival's inception 24 years ago. Even before that, Fred Lewis' annual shad haul had already become a rite of the season; more "expensive hobby" than commercial venture, but living testimony to what the river once meant to the towns and villages along its banks. Shad seining remains a vital part of the Festival as spectators line the river bank watching the boats manipulate the huge nets across the river bottom to the shore, filled with feisty fish. Another highlight of the festival is the shad bake. Each fish yields four filets taken from the fish at it "ripest". The shad have prepared for the migration by heavy feeding prior to entering the river. After this point, the fat and succulent fish, rapidly deplete their body stores, as approach their upriver appointments with parenthood. North of Lambertville, shad have come to play a new role in the Delaware Valley. Although classically a food fish, Shad have become quite popular as game fish and may one day gain that classification. Since shad do not eat during this part of their life journey, no one knows why they strike lures floated in their midst. Maybe the busy fish are simply easy to aggravate, or they're trying to kick away the invading darts and flutter spoons from spawning beds. But strike they do, much to the delight to a growing number of sport shad fishermen. These strong salty soldiers offer some of the best battles on the river, especially on light tackle. Even devoted hunters of the celebrated trout have been known to yield to the hearty pursuit of shad during the first months of spring! Gene Neiderlander, a retired Delaware River shad fishing guide, explains, "They're really a sport fish to catch. They just strike it and take off... they hit and they run. Your drag will be screamin'. Holding the rod up, they'll go 30-40 yards before they stop. If you're in fast water they'll turn side ways out there and they don't even have to move. You can't budge them, they'll just use the water. We've had to pull anchor and chase fish. But we don't want to, 'cause there are other boats on the water that will come take your spot." Gene knows his spots. He and his clients caught 892 fish one spring; 38 on one 5 hour trip. Between Lambertville and the river's headwaters it's safe to say that, in a good spring, well over 100,000 shad are caught by hook, line and sinker. A shad fisher who locates the procession's core can follow it upriver for weeks of great fishing. Spawning begins somewhere a little south the Water Gap and it is here that the schools begin to linger, building a season that runs from mid April well into late June. Neiderlander adds "The best time, I found, is in the rain when the water's rising a little. Boy, they go crazy. You want clear water because shad go by sight, not scent." The shad fisherman considers many intricacies- time of day, dart or spoon, water temperature and depth- but there is one overriding component to success: position. If you aren't in the path of the fish, you're in for a long day. There is speculation that shad somehow instinctively follow the same route up the river every year. A few feet can make all the difference when you aim your cast or choose to set anchor. The easiest way to find a hotspot is, of course, to watch other boats with guys like Neiderlander in them. But the complete sportsman wants to "read the river" for prolific channels or where fish are likely to swim along eddies on the edges of rapids, much as in a mountain trout stream. A shad is likely to follow the path of least resistance, especially after swimming 200 miles against the current with no food. If you find a spot when the water temperature is right (about 55), you're in for a busy day. After the run is over, thick bunches of fish mill around spawning beds, and you can to look for fish in pools well into June. Although a boat is an enormous advantage, Shad don't require special equipment to be a caught, The conventional lure for catching shad is called a dart, either plain or tied. For some reason, tied darts are popular in the Delaware while plain reigns in other rivers like the Connecticut. Six or seven years ago darts were joined by flutter spoons as an alternate, used mostly in early spring. Both colorful lures- some even glow in the dark- are designed for lively action and travel through the water with hook pointed up. A shad's mouth is paper thin on the sides and a hook will hold only in the top. Experts will tell you, to avoid snags and produce better motion, keep your dart small on light 6 lb line (and lots of it). A split shot about 2 feet up will get the lure to fish depth. An ultra light rod does three things: helps you cast to a wider range, gives you a better "feel" for the fish after it strikes, and makes for a more exciting battle. The state record shad is 11lb 1oz, but large shad commonly run about 6-7 lbs. Pay attention; they have been know to jerk the rod right out of the boat.